(W) Charles Soule, James Asmus (A) Stefano Casselli (CA) Steve McNiven. As the terrigen clouds continue to spread across the world, they leave in their wake the ruined lives of the Inhumanized. Now, Crystal Inhuman princess and former elemental Avenger leads her own team tasked to help as many of these NuHumans as possible. But Medusas sister has her work cut out for her. After all, the reactions of the newly super-powered vary wildly from fear to amazement to outright anger. Then there are the mysterious Skyspears that recently crashed into the Earth, making life even more complicated. But worst of all, theres a dictator hell-bent on turning Inhumans into weapons of mass destruction. As Crystals team comes together, shed better hope Gorgons training pays off or they wont all make it out of their first mission alive, even with Spider-Mans help! 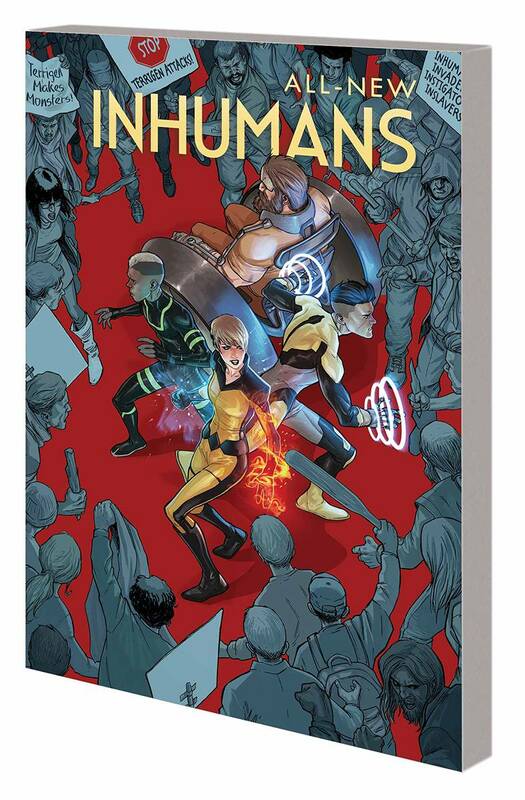 Collecting ALL-NEW INHUMANS #1-4 and material from ALL-NEW, ALL-DIFFERENT POINT ONE #1. Rated T+.